Redneck Baptism (#3) battles El Rayito de Luna down the stretch in Saturday's West Texas Juvenile Invitational at Sunland Park Racetrack & Casino. SUNLAND PARK, NM�APRIL 12, 2014�Redneck Baptism used a late surge to her maiden and win the $50,000 West Texas Juvenile Invitational Saturday afternoon at Sunland Park Racetrack and Casino. Under jockey Sergio Becerra, Jr., the sorrel filly completed the 300 yards in :15.041 seconds to pick up the winner's purse of $30,000. Gene Burden conditions the WAVE CARVER daughter out of Redneck Cowgirl, by The Signature, for owner Luis Rogelio Nava. Red Cactus Horses bred the sorrel miss in Colorado. She came into the race off a third place effort in the March 21st trials. El Rayito de Luna finished 1� lengths ahead of the field in second but was disqualified and placed 8th for interference. Arkansas-bred Aylin was moved to second place, earning $10,500. Emilio Cadena III saddled the chestnut filly for owners Gary Thompson, David Hinkins and Mike Abraham. 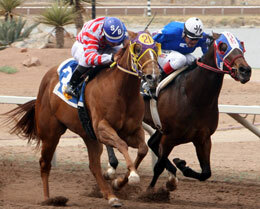 Esgar Ramirez rode the Corner K Quarter Horses, LLC bred. Marty Neugebauer's Paint Me Rusty was awarded the show check valued at $5,000. Wesley Giles trains the filly. Clyde Wilmott is the breeder and Larry Gamez was riding. What We Gonna Do Is, Pollstegeist, Gonna Rock You, Dimples Ocean, El Rayito de Luna, Legacy Menace and Perfect Menace completed the official order of finish.